- Season the duck legs and sauté in the duck fat until nicely browned. - Transfer in a roasting pan. Add the stock, the honey and lemon juice. is tender (approx. 1 hour and 30 minutes). - To check the state of cooking, prick the meat with a sharp blade. The flesh must not resist the blade either in or out. 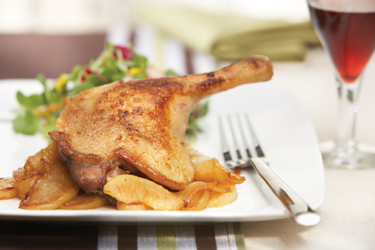 - As the duck legs are roasting, peel and coarsely chop fresh pears. to the hot mixture and sauté until lightly browned. You may want to sprinkle the dish with pink peppercorn or fresh herbs like rosemary or thyme.